Well, last week was easy to write, with all my pictures from the exhibition. I’ll have to go back to write something a little more original now…..
You may have noticed the lack of progress with my N-club modules. When I last wrote, it was about the fiddle yard. I’d been going round in circles trying to decide that fiddle yard arrangement. Another board, at right angles to the main lines, would be faithful to the prototype design. And although I’m not really modelling the prototype exactly, it would be good to keep this feature of the design. But I didn’t really want another board sticking out into the middle of the room. So a small hidden yard on the end board seemed best – and it got built, as shown below, with enough room for three short, but reasonable, trains to feed into the yard. But I just wasn’t happy with the design. I wanted to model a long road bridge (probably Rix) across the far end of the boards, to make a visual break, and a level crossing at the near end of the boards. This wouldn’t work with the fiddle yard where it is, and I just couldn’t put together the scenery in my mind. I wanted a fairly flat, empty, look, and hiding the fiddle yard with hills or big buildings or even trees didn’y seem to work. Model the curved branch, which would be a dummy at home, but could have a board added for exhibitions. 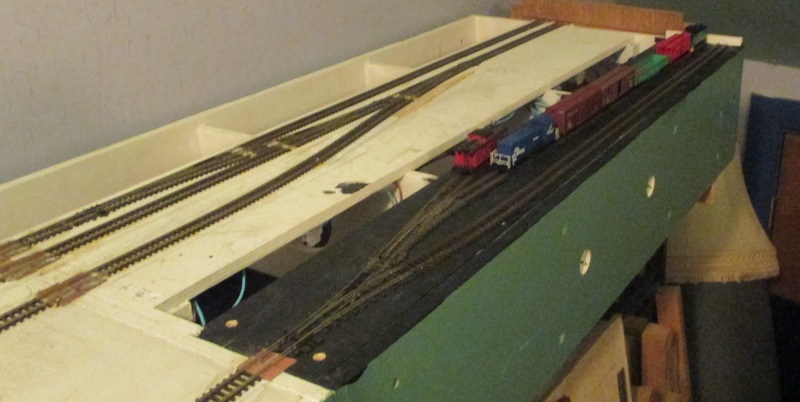 Add a short unsceniced 2′ board at the far end of the layout (in the picture above), that will give a longer headshunt from the main line into the interchange yard. Stage a train on both the up and down main lines, to give two trains to switch in a home operating session. Sorted! Well…. unless I change my mind yet again. Here’s the track layout, in case you’ve forgotten (I nearly have). The fiddle yard top left is going, and the line will curve off the top of the board. I suppose all this too-ing and fro-ing slows down my modelling no end, but I guess the thinking and working towards a solution is part of the fun. In the mean time, I am having a good sort out of the loft, and trying to tidy things up a bit. Not wasted time at all!